New York Jets Coaching Carousel: Is Rex Ryan Coaching for his Job? Around the middle of the season every year, speculation rises amongst disgruntled fan bases regarding whether the head coach of their beloved team will get the ax by the end of the season. For no coach has this been truer over the past years than Rex Ryan, especially this season. Since opening the season with a five-point win over the Raiders, the Ryan-led squad had dropped five straight before heading into Thursday’s matchup against the Patriots, including a 31-0 shutout at the hands of the Chargers. Adding to the embarrassment of that game was the admission from Michael Vick that he hadn’t adequately prepared for the week’s game. After Thursday’s close loss to the Patriots—which is always a big game in the Jets schedule—we wondered what Rex Ryan’s chances of skating through the year unscathed were and what he would have to do in order to have a decent shot at keeping his job. 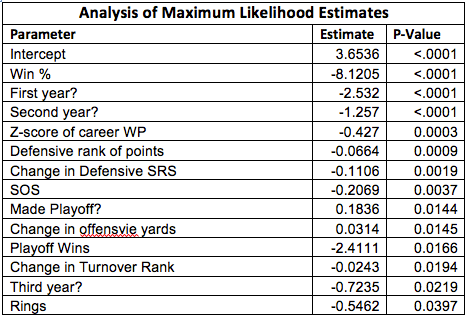 To try to tackle this question, we created a model that would predict the probability that coaches would be fired by or at the end of the season. We took data since 1980, and created a multiple logistic regression model using a variety of covariates, including the team’s winning percentage, past playoff experience, and offensive output. In an attempt to not overfit the model, we also tried to minimize the AIC (Aikake Information Criterion), which trimmed our covariate set down from the original 50 or so to the 14 most predictive ones. At the end, the ROC (logistic version of R squared) of our model was 0.8955, which is a satisfactory quantity. Making the playoffs and having a strong winning percentage rank as our two most significant covariates, which should come as no surprise. Other significant inputs include whether the coach was in his first year, whether the team makes the playoffs, and whether the coach has won a Super Bowl with the team. Point and yardage differential also factor in. 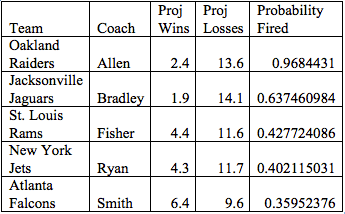 To see if our model could realistically predict which coaches get fired, we looked at the past two seasons to see if the model’s predicted probabilities reflected the actions taken by front offices after the year. In 2013, the coaches with the five highest probabilities of getting fired (all of which were above 47%) were indeed canned by their respective front offices. The next highest coach on the list – Dennis Allen of the Oakland Raiders – had a 45% chance of getting fired, but ended up staying. However, this year, after Week 4, his probability stood at 97% before he was promptly fired by the organization. 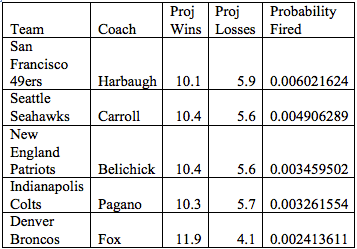 Two coaches whose chances of getting fired were 13%—the Browns’ Chudzinski and Titans’ Munchak—were also let go. But this doesn’t signal that the model is flawed—if the probability is around 13%, we would expect coaches whose teams put up similar statistics to get fired one out of eight times. No coach with a winning percentage below 10% was fired. To quantitatively evaluate we compared it to other models, which we ended up outperforming. 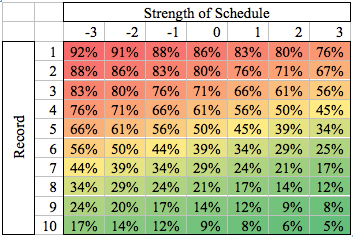 Before Thursday night’s game, Ryan’s chances of getting fired were 40%, due in large part to the Jets’ early season strength of schedule, a variable that factors largely into the model. Through Thursday night, the Jets have played one of the toughest schedules so far, facing the Packers, Lions, Bears, Broncos, Chargers, and Patriots—all in the top half of the league according to Nate Silver’s Elo Ratings. Their only win came against the lowly Raiders, who rank 31st by the same metric. Having faced these teams, the Jets strength of schedule through Thursday was 3.2, much higher than what it will most likely be at the end of the season. For reference, Neil Paine predicted their strength of schedule to be about -0.1, which would be a little below average. To answer the question of how Rex Ryan’s performance through the end of the year will affect his odds of staying in New York, we fixed all covariates but strength of schedule and wins to create a heat map of possible probabilities that Ryan is fired based on different combinations of SOS and wins. Red cells indicate a higher chance of packing his bags, while green cells mean he has a good chance of staying (which may not be good for either party). For simplicity, since making the playoffs is a covariate in itself, we assumed that if they finish with a record of 9-7 or above they will make the playoffs in the relatively weak AFC. It looks like to stay under the 50% threshold, Ryan has to lead the 1-6 Jets to 5 wins, or hope that his schedule ends up looking like one of the hardest in the league. To reach the 10% threshold, he will have to at the bare minimum close out the season with an 8-1 run. Dennis Allen had a 97% chance of getting fired after Week 4 before the Raiders let him go. Bradley, after a year of grace in his first year as a head coach, should now be on the hot seat, as should Fisher and Smith should he fail to make the playoffs once again. Interestingly, rumor has it that Harbaugh, who ranks amongst the five coaches least likely to get fired by the model, is no guarantee to remain with the 49ers heading into next season. However, the other four – three of whom have been to the Super Bowl as head coaches – are essentially locks. Will Rex Ryan get fired? All we know is that we can’t wait to find out. So now that the Jets are 2-8, do you think the Jets have to go 3-3 or since the Jets have a slightly more difficult schedule (estimated 52% opponent in 2013 win percentage or including week 10, 68% win percentage in 2014), like 1-5 to have a 50% chance of being fired?